We’ve discovered one reason why mistletoe isn’t so common at this end of Brittany – it’s just a little exposed in places. 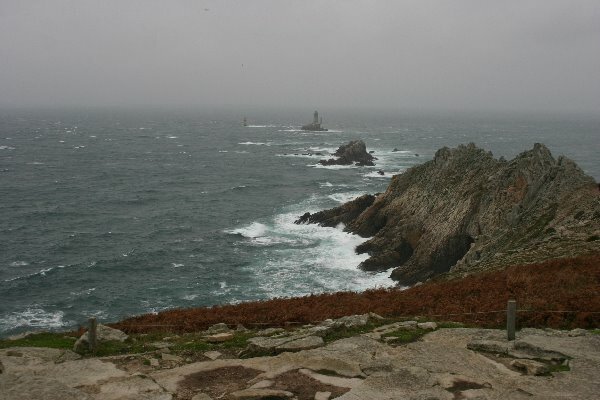 This pic shows the Pointe du Raz (you have to pronounce the ‘Ra’ bit in a sort of snarl to get it right). 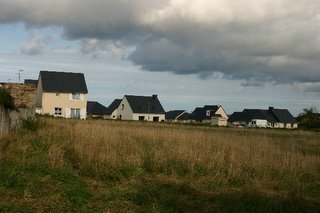 This is France’s answer to Land’s End (though not actually the most westerly point, that’s on the other jagged bit just to the north). A long drive down to here – so long we began to wonder whether it was worth it – but yes, actually it was. Not least ‘cos it shows up how awful Land’s End is and what it could be with some tasteful tlc. Here at Pointe du Raz they’ve closed the road, demolished the old visitor centre, and built a new one set 500 metres or so inland. The car-park is landscaped with traditional walling. 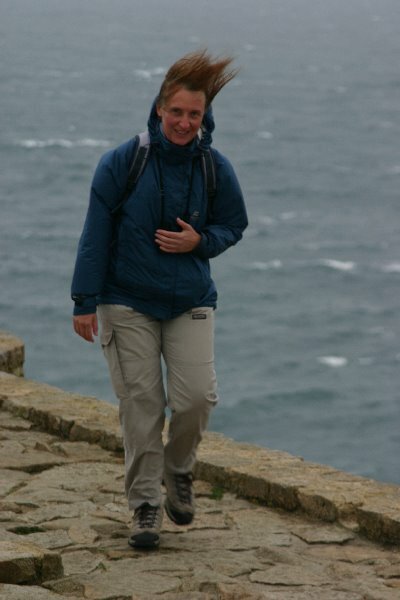 You can walk down to the point on the old trottoir, or on the coast path, or take the gas-powered bus. Very sensible, very in keeping, but probably very expensive to achieve… The visitor centre is suitably informative, though inevitably surrounded by souvenir and refreshment shops. The point itself is, er… windy. As proved by Caroline, here displaying her new punk hairstyle. 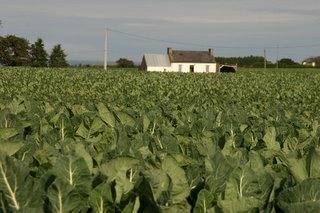 There may be little mistletoe in this part of Brittany but the vegetation is stunning for other reasons – field after field of artichokes and brassicas (cabbages, cauliflower etc). A regular Cabbage Patch Corner – which makes me start humming tunes (We are the Plotters of Cabbage Patch Corner, the Rotters of Cabbage Patch Corner, the plotters, the rotters…) from a David Wood children’s play, last seen c. 1970 at the Swan Theatre, Worcester – (since returning have found this link to info – see left- on it!). 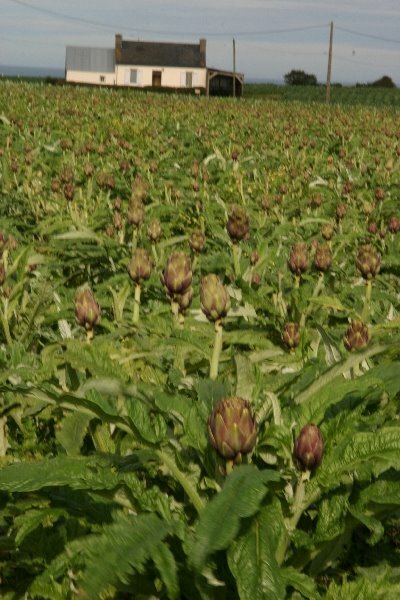 But I digress, let’s get back to the artichokes. 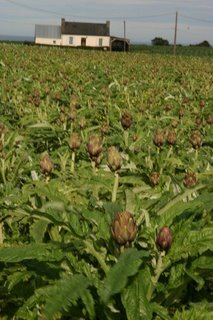 The eating of artichokes has always been a bit of mystery to me, seems a lot of trouble for little gain. I grew some at home this year, but left the plant to bloom – partly to compare to the adjoining Cynara thistle, but largely ‘cos they look prettier flowering. 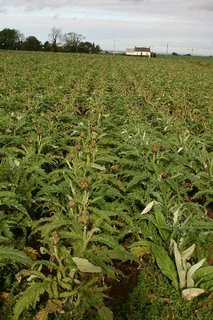 Both artichoke and Cynara are now seeding happily – am not sure what the neighbours make of the prospect of giant thistle seeds coming over the fence. Naturally we ate some artichokes – both boiled and microwaved (in a ‘micro-onable’ bag) – still not sure whether they’re worth the trouble – but my vote goes for the microwave version. 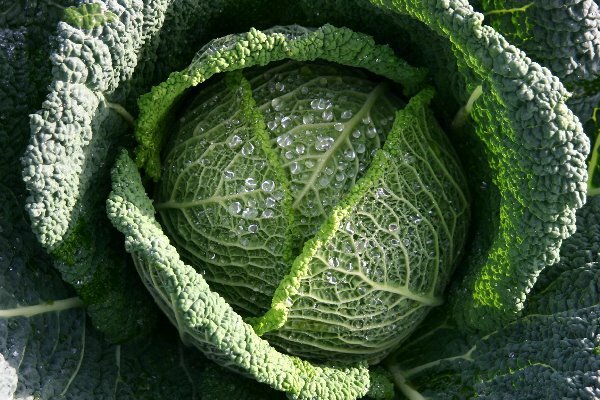 And a cauliflower of course. Goes nicely with cheese. 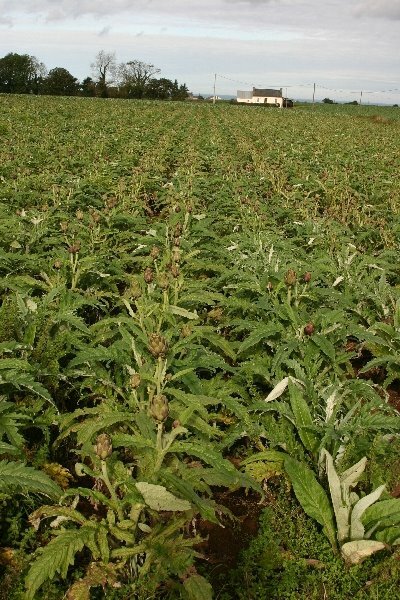 Forget the mistletoe, have you seen the Artichokes? In Brittany, on hols, but dabbling in mistletoe matters. As reported previously, we are intrigued by the absence of mistletoe in these parts, and the accompanying absence of the famous Breton orchards (vergers). We investigate, largely using a method known as ‘cider-drinking’; this involves buying all the different brands of local cidre we can find, and, er, drinking them, whilst noting the address of the maker. We conclude that we’re still in the wrong part of Brittany – the cidre makers, and presumably their vergers, are more inland and mostly in the Val de Rance area. There are a few orchards about, but these are small, and mistletoe-free. 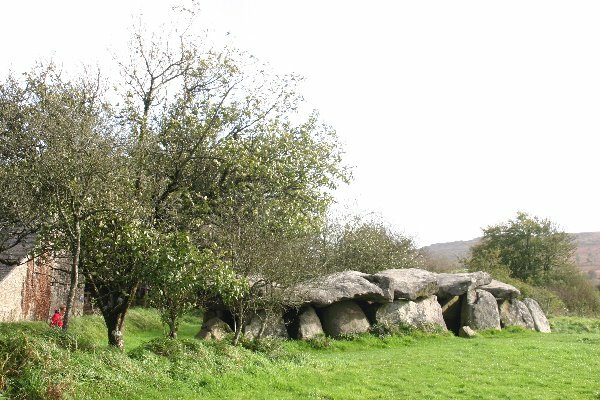 Stunning locations though – see pics of the Allee couverte du Montgau below. 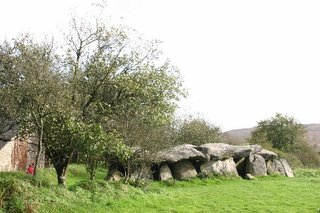 A typical Breton megalithic monument – set in a tiny orchard (but no mistletoe). The Monts d’Arree are in the background. 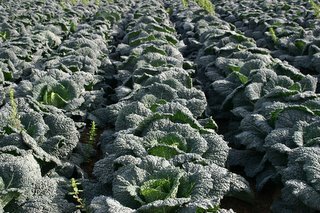 No matter, the local vegetation has other merits – there may be no mistletoe but there are acres and acres of cabbages, cauliflowers broccoli and artichokes – more on these in next posting. 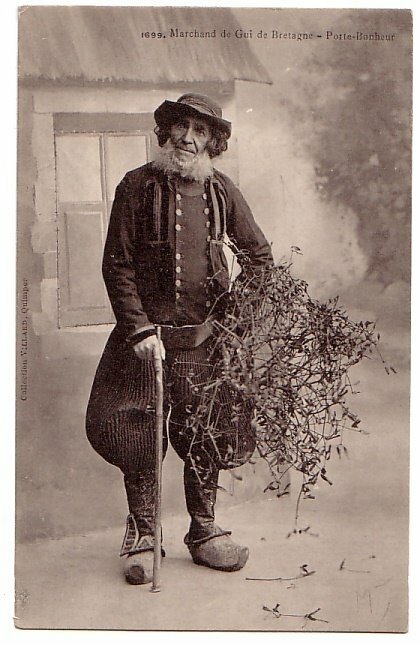 Brittany is, by tradition, where a lot of mistletoe (le Gui) grows – it is after all the land of the Druids, and the home of those indomitable Gauls Asterix and Obelix (mistletoe is the principle ingredient in their strength-giving magic potion). There are Breton mistletoe festivals, and period pictures (see left) of Breton Mistletoe Sellers – Marchants du Gui. 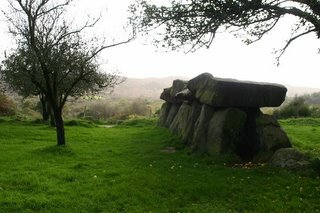 So why is it that on previous trips to Brittany we’ve hardly seen any Gui? Normandy has loads of it in the apple orchards, as does the rest of France. But when wandering the south western parts of Brittany a few years ago we saw very little. This time we’re in northern parts, just inland of Roscoff, though travelling via St Malo (once a great mistletoe exporting port). Will there be plus du Gui ici? (you’ll have to excuse my bad French). Well, no, not a lot. 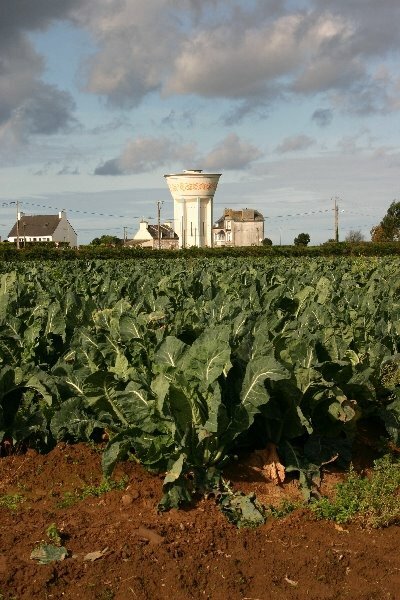 Fair amount visible from the coast roads between St Malo and Roscoff – some splendid stands just inland of Cap Frehel, but not much really. There are several factors to consider – the two most important being season and orchards. The season is still early – most host trees still have their leaves and so not all mistletoe will be visible. But the poplars, classic French mistletoe hosts, have lost their leaves already, and there aint much mistletoe about. Contrary to expectations there will be Mistletoe Auctions in Tenbury this year – though the venue hasn’t yet been announced. Dates will be Tuesday 29th November and Tuesday 6th December. 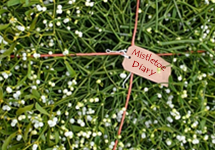 In addition to these there is now a scheme to order Tenbury mistletoe – retail or wholesale – online. The online shop isn’t open yet, but you can find it at www.tenbury-mistletoe.co.uk, where you can register and be informed when it opens for business – probably mid-November. The idea is to make Tenbury mistletoe available more widely, carry on the Tenbury mistletoe growing/trading tradition (the auction’s future is still in doubt) and encourage people to use proper English mistletoe – not imported stuff, and certainly not plastic!! A bit of blog-free week – too much work on the canal restoration lottery bid front. But I have had time to do a bit of mistletoe work, – attending a planning meeting for the forthcoming Tenbury Wells Mistletoe Festival last Wednesday evening. The events begin on Saturday 26th November, with Grand Mistletoe Ball. Followed, in the week afterwards, by mistletoe sales, crowning of the Mistletoe Queen (on Mistletoe Day, 1st December – due to be announced in Parliament soon!) , and Mistletoe Art Exhibitions and workshops. Plus a Rock’n’Roll Concert on the 2nd December. 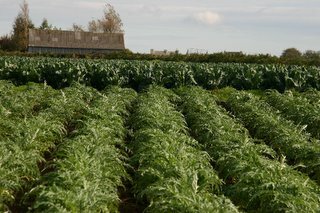 For more details of all events point your browser at www.teme-mistletoe.co.uk. Hot on the heels of Lambeth’s secret mistletoe database, I find that mistletoe in the London Borough of Richmond has been bugged! And no I don’t mean as an anti-mistletoe rustler deterrent (don’t be silly!) – I’m talking about bugs – small insects of the order Hemiptera (Miridae, if you want to be more precise). The story is this; back in July 2003, a new mistletoe-dependent bug, Hypseloecus visci, was found on mistletoe on apple trees on National Trust land in Somerset. Dedicated mistletoe diary readers will (of course) recall that the NT mentioned this in a press release back in December 2003. Since then, in best bug-hunting tradition, it has been found on other sites in Britain, including Bushy Park, Richmond. So what? Well, the Bushy Park record was news to me (announced in the British Journal of Entomology and Natural History on Thursday last week – via David Gibbs and Bernard Nau), and it’s critically important to my work on London Mistletoe – which requires more work on mistletoe-dependent insects in London. And, being the mistletoe anorak that I am I have to admit that, on the desk before me, there happen to be some insect samples from Bushy Park mistletoe, waiting to be sent off for expert id… are there some more Hypseloecus visci in the samples? I will tell all in due course….